MAJOR interest has been growing in the potential opportunities for Scotland overall, and individual businesses specifically, in decommissioning redundant oil and gas rigs. 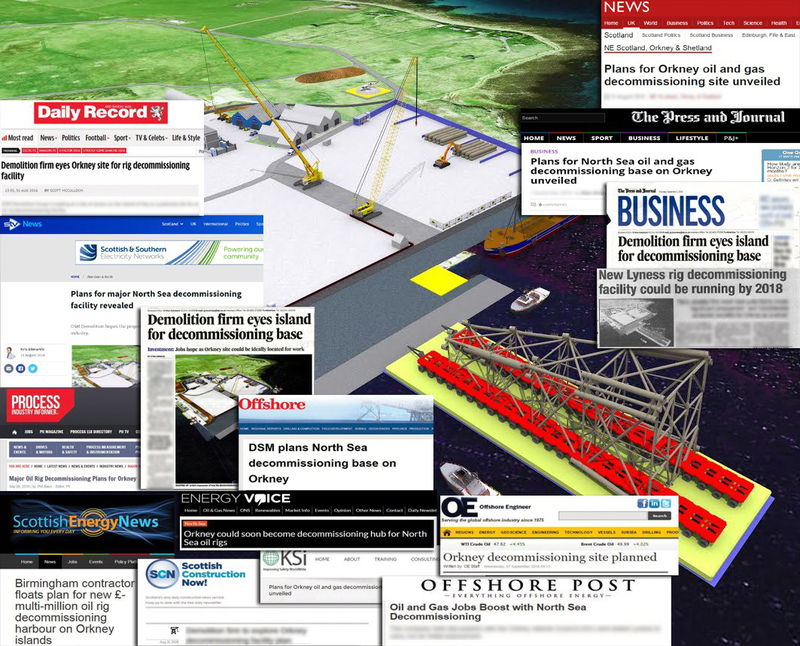 To help bring awareness of their plans to create an ambitious decommissioning facility on Orkney, DSM Demolition challenged us to create a high quality and expert media launch of its proposed yard. The new site is set boost jobs on the island as well as allowing DMS to take advantage of the expected boom in North Sea oil and gas decommissioning work. But there was a need for a two-step approach to ensure the media announcement was tightly managed to, 1. To target local Orkney media to ensure there was buy-in from the local community on Orkney; and 2. To have DSM’s proposal highly positioned in the oil/gas media to support the drive to win new decommissioning work. The first step was an unbridled success, securing front page news in The Orcadian; the main business lead in the Press and Journal, a top headline on BBC Online Highland, and a main feature on Radio Orkney. Further influential coverage was also secured in some prestigious national titles such as STV.tv, Daily Record. The drive to target trade publications in oil, gas and construction, saw high impact coverage in Scottish Energy News, Scottish Construction Now, Offshore Magazine and Processing Industry Informer among others. In total, we managed to get the DSM story out to an audience of 4,868,270, reaching more than just the islanders on Orkney. WANT BUSINESS TRANSFORMATIONAL PUBLIC RELATIONS? DSM Demolition enjoyed a massive boost in its public profile by commissioning Holyrood PR to help tell its stories to the world .